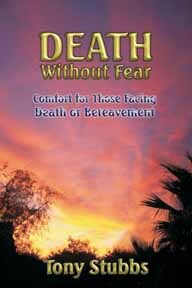 In his latest book, Death without Fear: Comfort for Those Facing Death or Bereavement, just released by Dandelion Books, Stubbs writes: “Open up to the wildest ride of your life as you cross the final frontier. Who are you really while you’re alive? Where is the afterlife and what will you do when you get there? “Fluffy clouds and harps?” writes Stubbs. “No, on the other side, you learn, grow, play and enjoy freedoms and love you can’t begin to imagine on this side. "Contrary to what organized religion tells us, you are whole, youthful, eternal and very playful, not somber and serious. “Ignorance about the afterlife leads to fear. This book dispels both – a “must-read” for anyone in a physical body who will one day face death, whether yours or that of a loved one. “Because we can’t really know what happens at the moment of crossing over without experiencing it ourselves, this book includes excerpts from accounts by those who have already crossed over and are reporting back through gifted psychic mediums. He has ghostwritten and edited some of the world’s most popular books on spirituality, death and NDEs. For more books about spirituality and conscious solutions, click here.